Over the past two years I have attended all the Kelsey Conferences, for those of you know familiar they conferences focus on the directional, vertical and local search markets in print and online. One common theme that has grown in popularity over the past 24-months is the emergence of video in the small to medium sized market. I started to surf around YouTube to see if I could find local businesses in Canada taking advantage of this medium. One company, Oliver Jewellery in Toronto really jumped out as a local business who really gets this medium. Rate and review Oliver Jewellery in Toronto. The first thing that impressed me was that one of his television commercials has been viewed over 42,000 times, has had 173 ratings, 277 text comments and been a favorite 415 times since January 1, 2008. To put this into perspective – I conducted a search for “toronto” in YouTube and this one video would have been within the top 400 videos which is pretty impressive considering this is a local business with one location on Eglington Avenue West competing with all types of videos under this particular search term. The second thing that impressed me about this local business is the fact that his YouTube username channel has 11 videos uploaded including some self-promotion with WWF superstars and 76 subscribers. This is a very good example of a local business taking their local television commercials and broadcasting them beyond the reach of the local television stations. All of this is good, but the key question is whether this is driving business. Regardless if it is or not this is a good example of cross-media mix for a local business. 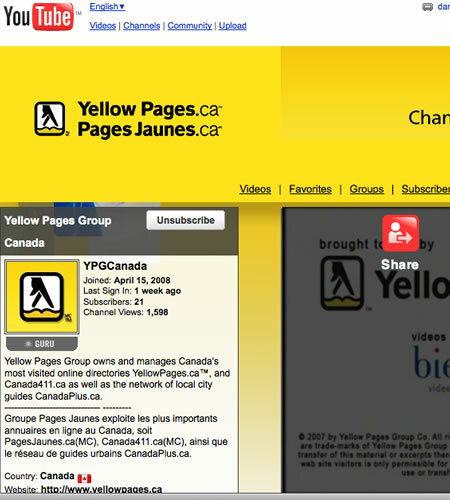 The other big player in the local Canadian Small Business YouTube space is Yellow Pages Group with their branded YellowPages.ca YouTube Channel. Currently this channel has over 900 local videos with the top video from Yoga et Massage pour vous – Montréal with over 3000 video views since upload on September 20, 2008. If you want your business listed in the YellowPages.ca YouTube Channel – check out the Showcase Bundle. Interested in reading more about local video optimization – check out the following post at Praized Media “How to SEO Local Video Advertising“. This entry was posted in Local Search Tips, YouTube and tagged oliver jewellery, video, YouTube on November 10, 2008 by Darby Sieben.